When it comes to conquering obstacles; twelve-year-old Micah Blackwell has weathered the storm. A traffic safety mural that grew out of concerns about children being struck by cars throughout the city in large part to the generosity of the Eagle & Badge Foundation. 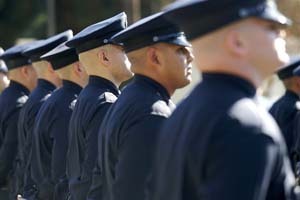 The Eagle & Badge Foundation is proud to support LAPD officers who participate in raising money for cancer research. Relay for Life is more than just a fundraiser. It is an opportunity to get together with family and friends and celebrate cancer survivors, remember loved ones lost to cancer and fight back against this disease. With the help of the Eagle & Badge Foundation, LAPD officers have taken part in this inspirational event that takes place over 12 hours in many communities. When a police officer anywhere is killed in the line of duty, LAPD officers mourn along with the City and the family and then the Eagle & Badge Foundation does something about it. Every day when LAPD officers go on duty, they know the dangers they are facing, yet it is still devastating and shocking when we lose one of our own. The Eagle & Badge’s first donation in 2001 was for a specially trained dog for Jake, son of an LAPD Sergeant with moderately severe autism. With the help of the Eagle and Badge Foundation, Jake was provided with a Labrador retriever named Boo.